Average skills are no longer enough to get or keep an average job, and you need even more when you are working in the technology-driven world of eLearning. 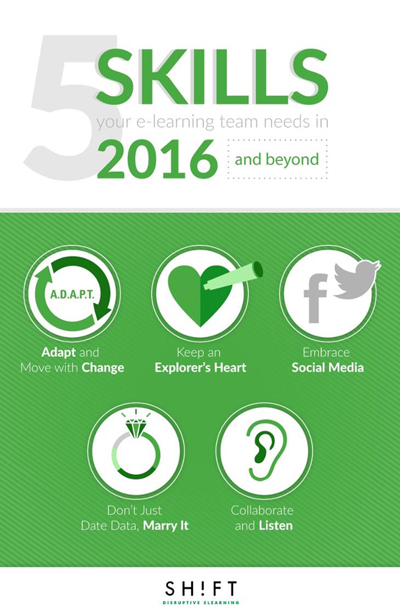 To give you and your eLearning team a fighting chance against the machines, learn, love and live these skills to succeed in 2016 and beyond. The skills of adaptability and agility are more important than ever because the days of releasing a single product as is and having it solve the problem are gone. Ideas are no longer created in a smoky room and manufactured in secret. We need consumer (learner) input to effectively create products for those consumers and even if by some miracle we do create something useful without outside influence, by the time we release it, it will be outdated. Technology is not just a tool to get tasks done faster; it is also a tool for exploring unknown problems and identifying advantages. Keep in mind that the things you really need to do on a job to stay ahead really can’t be defined in a job description. To stay relevant in you eLearning team, you need to go beyond the minimum requirements and continue learning and increasing your value. One of the best ways to stay ahead of the pack is to engage in social media yourself by joining and interacting in learning communities, forums, and blogs. Internal social networks like Slack or Yammer will help you integrate and engage with your peers by being able to share ideas, conference with team members, collaborate on solutions and increase productivity. You need data and so do your students. The independence and lack of external controls that students feel from eLearning can have many benefits but also a downside. In order to make sure employees are actually retaining info, not just learning it for the course, you need to implement things like tests and quizzes to monitor retention and give feedback to learners. Let them know if the are on the right track and what needs to be improved in order to motivate and give them the tools to problem solve on their own. Very few things are created a single person anymore, especially in the worlds of digital learning and online training. It is more important than ever to listen to peers and experts in your field to fine tune your work. Even more important than simply listening to others is appreciating the benefits of diverse thoughts.